COLCHESTER, Vt. – A trio of Saint Michael’s College student-athletes – senior swimmer Alex Canning (Marshfield, Mass./Marshfield), junior women’s cross country/Nordic skiing student-athlete Lauren Fereshetian (Turner, Maine/Leavitt Area), and sophomore men’s soccer player Rondel Ward (Saint George, Barbados/Harrison College) – have been picked to represent the College later this month at a pair of NCAA conferences in at Walt Disney World Coronado Spring Resort in Lake Buena Vista, Florida. 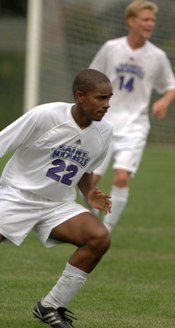 Ward, a computer studies major with a 3.887 cumulative Grade Point Average, has been a member of the Saint Michael’s men’s soccer team the last two seasons. He has played in 12 contests the last two seasons for the Purple Knights, helping the squad to a 17-13-7 record in that span. A member of the College’s Diversity Coalition and Martin Luther King, Jr. Society, Ward has also volunteered as a teacher for underprivileged children in his home country, and has earned awards from the Barbados Government for exemplary work in the computer studies field. … BFP editor’s note: The above was taken from a recently received press release. For over two years, personnel of the Barbados Anti-Money Laundering Authority (AMLA) illegally shared confidential financial, banking and other information with law enforcement agencies and governments around the world. Just one little problem: AMLA personnel had no legal authority to do what they did. AND THAT, my friends, means that Barbados AMLA personnel committed crimes. Lots of ’em – at least one for every time they transferred or received certain information. According to the legislation proposed by the current Barbados Government, the AMLA personnel were operating illegally from August 1, 2006 to September 14, 2008 (both dates inclusive). In 2006, Owen Arthur was Prime Minister. The BLP Government had several Attorneys General with the last being Dale Marshall who famously failed to pass the required legislation to make the new $300 million Dodds Prison “official” – thus delaying its occupancy by inmates. Mia Mottley was also Attorney General under Owen Arthur. In August 2001, then Attorney General David Simmons (now Chief Justice) delivered the feature address at the launch of the Anti-Money Laundering Authority. Each one of the BLP Attorneys General had the responsibility for AMLA but it seems that the government fouled up in August of 2006 and the unit operated without legal authority until September 15, 2008 – some eight months into the new DLP government of David Thompson. One can hardly blame the current DLP government for failing to immediately realize that a government agency they inherited was operating without legal authority to do so. There is, however, the matter of all the money that the USA has provided to Barbados to establish and operate the Anti-Money Laundering Authority. Did A Blog Article Set Off American or Barbados Government Alarm Bells? On February 16, 2009 the Keltruth Corp’s Barbados Money Laundering and Offshore Business Advisory blog published a story that asked Does the Barbados Anti-Money Laundering Authority Really Exist? But guess what friends? AMLA doesn’t pass the smell test for being a real and operational government entity! Our bet… AMLA is nothing but a paper shell operating out of the Financial Intelligence Unit and is not a stand-alone organisation with independent staff as mandated and pretended by the Barbados Government. Why would they pull off that fast one? For the U.S. aid money, of course! Judging by the legislation put forward today to “legalize” the past illegal acts of Anti-Money Laundering Authority personnel, the folks at Keltruth Corp. may have raised the alarm with their February 2009 report. While we hardly expect the Barbados or American governments to admit that an article on a blog had anything to do with this latest legislation, at the very least the legislation shows that Keltruth Corp. was spot on with their doubts about the legitimacy of the Barbados Anti-Money Laundering Authority.